Hundreds of thousands of women take to the streets to stand up for their rights. WASHINGTON DC — Twenty-four hours after Donald Trump was sworn in as the 45th president of the United States, hundreds of thousands of women flooded the streets of Washington, D.C., New York City, London, and more cities around the world in protest. "We march today for the moral core of this nation, against which our new president is waging a war," actress America Ferrera told the Washington crowd, per the AP. "Our dignity, our character, our rights have all been under attack and a platform of hate and division assumed power yesterday. But the president is not America. ... We are America and we are here to stay." While estimates before the march predicted 200,000 would attend the DC march, officials quickly doubled that number to about 500,000 as the streets and subway systems were swollen with attendees. Organizers estimated millions of people participated in up to 600 "sister marches" globally. Photos show massive crowds in New York City, L.A., Philadelphia, Chicago, Miami, Orlando, Denver, London, Boston, Ottowa, Berline, Paris, Prague, Sydney, and even Antarctica. Crowds in Chicago overwhelmed police authorities and the march there was officially canceled and turned into a rally after thousands of women filled the streets, according to MSNBC. An estimated 750,000 people attended the LA rally. A stage in Washington hosted a spate of celebrities who rallied the crowd along a variety of issues. Director Michael Moore, actress Ashley Judd, actress Scarlett Johansson, feminist icon Gloria Steinem, Madonna, and Alicia Keys all took the stage. "Welcome to the rebellion of love," Madonna told the crowd. "It seems as if we've all slipped into a false sense of comfort. That justice would prevail and that good would win in the end. Well, good did not win this election. But good will win in the end." "We are not afraid. We are not alone. We will not back down," Madonna said. "It is the beginning of much needed change." Global Citizen saw a security guard along the route was hugging and high-fiving marchers as they passed by on a street in DC. "I may be tired but I'm not too tired to work for all the women," she said. "That's why I wore my pink lipstick." 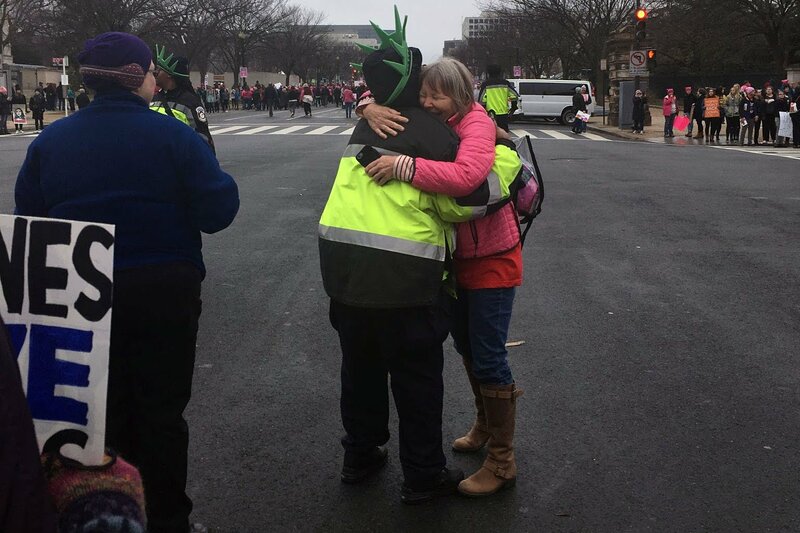 A security guard hugs a marcher in DC after saying, "I may be tired but I'm not too tired to work for all the women. That's why I wore my pink lipstick." Hillary Clinton, who was defeated by Trump in the presidential election, issued these words of support on Twitter. "I would say I'm marching for women's rights, especially access to affordable healthcare and in support of Planned Parenthood and all women having access to reproductive healthcare," Jess Kiesa of Virginia told Global Citizen. "I'm marching so my daughter doesn't have to and so she can grow up in a world where she has the same rights and pay and opportunity as a man." Jeanne, from Maine, told Global Citizen said she's marching in protest of Trump's use of hate speech. "My son married a woman of color and she's been in my life for five years, and it deeply affects me," Jeanne said. Her family lives in a town with a large Somali population. "My son works with so many children of immigrants and when I see people talking about immigrants and calling them terrorists, it touches me personally. I feel it." Linda Russell, from Maine, told Global Citizen she's marching for a few reasons: Because he is "vilifying everyone who doesn't agree with him — Mexicans, John Lewis, women." Russell also said she was marching for universal access to healthcare and reproductive rights. "I hope [the march] draws attention to the issues and people feel inspiration to donate and call their legislators," Keisa said. "That it's a point of inspiration, not for the a president or the Republican Party, but for the women here. I hope they go home and vote with their wallets and take action locally." 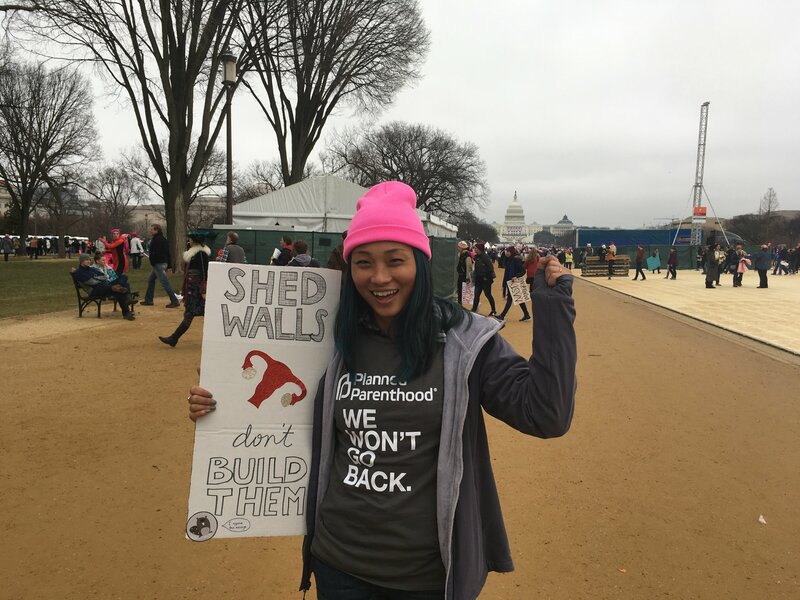 Adria Orr, 29, of San Diego, told Global Citizen: "I'm marching for reproductive justice because the notion that women are not in control of their own bodies and destinies is the root of so much injustice in the world." Here's how the protests looked around the world. The new president’s reputation with how he treats women fueled the day’s events. In that same video, he said “You know I’m automatically attracted to beautiful — I just start kissing them. It’s like a magnet. Just kiss. I don’t even wait.” He’s also been accused of making unwanted sexual advances by women who worked for him and by women competing in the beauty pageant he owns. Aside from personal accusations, Trump and the Republican Party he represents have said they plan to defund Planned Parenthood, which is the primary method of healthcare for 2.5 million men and women in the US. Trump’s also said he will appoint Supreme Court justices who will overturn Roe v. Wade, which makes abortion legal in the US. Trump was also deeply unpopular with women at the polls, and those sentiments have carried over into recent approval ratings.